The big problem with Life with Kozo (i.e., this column, and not my actual life, though that has its share of issues) is that I inevitably seem to be covering the same territory. About one month ago, I set out to write one of these silly columns because I felt it was time to, but unfortunately, I stalled. The same topics constantly come up: uncertainty over what to do with this website, lack of time, lack of purpose, annoying e-mails, no time to answer e-mails, confusion over my new job, confusion over what I should be doing with my life, and just plain confusion. Apparently, these are confusing times for me, though that label could easily be applied to the greater sociopolitical climate. Look at it this way: when people start finding alarming anti-Bush rants in Star Wars Episode III, then you know something is just plain weird in the world. My solution: go back to bed, crawl under the covers, and stay there for a week. Sadly, I cannot do that. Or, I could, but it would probably meet with disapproval at my workplace, not to mention shame at the fact that a grown man is so frazzled with dealing with the day-to-day that he would rather snooze for 168 straight hours than attempt to get ahead in this world. The problem: what is "getting ahead?" In the employment sense, "getting ahead" means moving up the job ladder, achieving promotions, adding to your portfolio, and generally becoming a master of some universe - even if that universe is as unglamorous as the fast food industry. I personally don't belong to the fast food industry, though the level of glamour in my line of work is seriously debatable. Basically, is it desirable to spend 45-55 hours a week holed up in an office staring at a computer screen? Common sense says no, but since nearly everyone I know does just that, there must be a disconnect somewhere. I'm just trying to figure out where it is. But yeah, "getting ahead" is what we have to do, because to do so indicates progress. And, as everyone knows, progress is necessary, or at least the goal of every 12-Step Program. Part of progress is "meeting expectations", because if you can't meet expectations then you're surely not going anywhere. My big problem: I have no idea what my expectations are supposed to be. What are my expectations since moving to Hong Kong? Simple survival? A new Hong Kong movie review a week? Fluency in the language? If the above three are part of my expectations, then I'm only batting .333. On the issue of simple survival, I seem to be alive and free of any debilitating diseases or hangups. Basically, I function like a human being is supposed to. Woohoo. However, the other two expectations are not so hot. Since arriving here, site updates have dipped from weekly to biweekly, which has actually impacted site traffic - or so I believe (it's really hard to tell with these things). At the same time, reviewing one new Hong Kong movie a week is impossible, because THERE ARE NO HONG KONG MOVIES. The cinema over here is eroding quicker than Michael Jackson's reputation, which saddens me immensely (the Hong Kong movie part saddens me, not the Michael Jackson thing). The fact that it coincides with my move here is probably a tad ironic, if only because LoveHKFilm.com is sometimes noted for "hating everything." Of course, that's a complete fallacy, but some people delight in pointing out, "Wow, you're so cynical! You hate everything! How can you say you love Hong Kong film?" Well, I like it a hell of a lot more than most people in Hong Kong, that's for sure. My view on Hong Kong Entertainment is very much on the outside, but from what I can tell, Hong Kong people don't generally care about the film industry. Hell, it seems that they don't even care to go to the movie theater...they'd much rather rent a DVD, buy a bootleg, or - as is the current rage these days - download it illegally. It's quite popular for people to think that downloading films does not hurt the industry because "I'm just one guy...how does my single download hurt the industry?" Well, it does, make no mistake about it. You are not one person...you're a collective of many who do exactly what you do: steal intellectual property. If a lot of people do one thing, it makes an impact. It's called math; look into it. For the third problem, yes, I am not fluent in Cantonese, nor is it improving at a rapid clip. The biggest problem is simply time. Between this site, my regular job, and that unnecessary thing known as sleep, I have no time to do anything. I barely have a social life as it is, which is probably a relief to females worldwide. Unfortunately, it worries my parents that there will never be a Kozo, Jr. to carry on the family name. I suppose I should consider fluency in Cantonese to be necessary if I wish to fulfill their Mrs. Kozo mandate while I'm in Hong Kong, but it's actually not my primary focus at the moment. That focus: a new stereo, which I still don't have after nearly four months. The problem here is twofold: no ability to play CDs except through my television, and I can't throw the long-awaited housewarming party because I can't play music. So yeah, a stereo would be nice. And speaking Cantonese would help me get one for a lot less money. But unfortunately, I'm not the only person who expects that I should speak Cantonese; everyone else in Hong Kong seems to expect it. Just by looking at me, they think I should be speaking their language, because duh, I look like them. Case in point: since arriving in HK, I've had the pleasure of meeting a couple of other Hong Kong Cinema webmasters who make their residence here, and we've met up for the occasional dinner and/or movie. Two of them are Caucasian and have lived here for years; ergo, they have Cantonese language ability, which is great because they can order my food. But here's the problem: the waiters, waitresses, etc., never speak speak to them first. Inevitably, when we sit down, the restaurant employee sees a white guy and a Chinese guys and thinks, "OK, talk to the Chinese guy." Bad move. All I can do is nod, and then point to the white guy, because they're far more equipped at speaking the language. I can only imagine how silly this makes me look in public. I'm so foreign to Hong Kong that I have to rely on people who look foreign to get around. It's like being an NBA player and being unable to make an outside shot...though if you consider the current state of the NBA, then I'm right up there with a number of high draft picks, who possess the natural talent to make it in their arena (the NBA for them, Hong Kong for me), but lack that one vital skill. The result: their game has a major hole that makes them less than they could possibly be. If you're Michael Jordan, you work at it and get that outside shot down, in which case you go on to six championships and untold legendary status. The alternative: you become Antoine Walker, a streak shooter who hoists too many three-pointers to be truly effective, and has been traded twice in his career. In a rare bit of irony, Walker has been traded back to Boston, which was his first team. The analogy for me is that even if I fail in Hong Kong, I can head back to the U.S., though I will likely never win any championships or ascend to legendary status. Instead, I'll keep throwing up bricks and will never live up to the expectations of many people, starting with my parents and continuing all the way up to my current employers, who brought me to Hong Kong in the first place. I will be a failed draft pick, who never lived up to his potential or high contract status, and may become a journeyman player who signs with numerous teams attempting to one day win a Championship before I get too old. In a literal interpretation, the above paragraph makes no sense, much like the average Wong Jing movie. Still, the point is that I have a golden opportunity that I can either make or break. Based on potential and perceived ability, I've been given the chance to either succeed in Hong Kong as some sort of an expat Hong Kong Cinema expert. Or, I can fail, return to the US, and continue trying to run this site - only with the added label that I never lived up to expectations in HK, and had to pack it in and return to George Bush Land. I'm supposed to be using this time to accomplish something, but the current situation is as supportive as the Hong Kong moviegoing audience. I experience disdainful glances from waiters and waitresses, plus I experience the indignity of not being able to pick up any potential Mrs. Kozos because I can't communicate with them. The result: my parents won't have grandchildren, I still won't be able to order food at restaurants, and I will have to live with the knowledge and shame that I didn't meet expectations. And all because I could never develop an outside jump shot. Um, I mean speak Cantonese. Either/or. 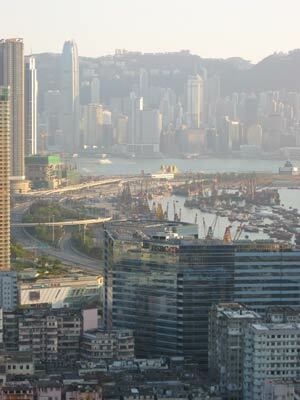 The above is the view from my Tai Kok Tsui apartment, and also the primary reason I'm paying the rent that I am. Just think, if you make a Hong Kong Cinema website, one day this view could be yours. Really, please try. I could use the company.